Oh Snap! The Friggin Amazing J.Ho Sketchblog...: I'd be lion if I said this wasn't a terrible title. I'd be lion if I said this wasn't a terrible title. Today's illustration is a monstrous steed for the subject of my previous post. 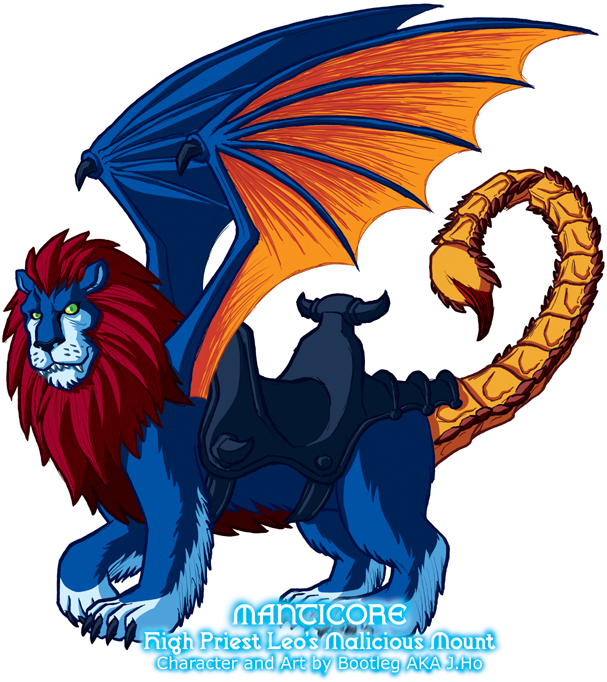 He resembles his mythological namesake, but with some minor differences, and of course he's patterned after Battle Cat, Panthor, and my own fan character, War-Tiger. He is not to be confused with Montecore. This one feels a little stiff and "blah" to me. But as longtime readers will note, I live my life by the phrase, "they can't all be winners." I'm happy with the color scheme though... I feel like I successfully emulated the bright and garish style of 80's action figures. Forward, to the nerdy bio! What? No mention of Aslan? FYI: I love the colors. The inactivity of the pose, however, leaves me indifferent. But you seem aware of that.